I Think, Therefore I blog: We don't need U,S. aid! We don't need U,S. aid! 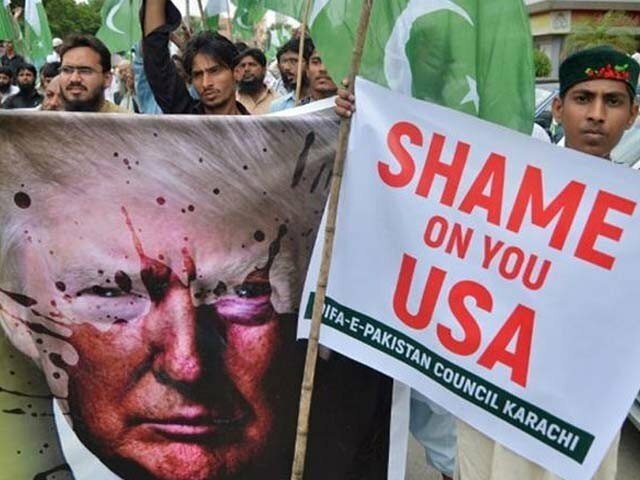 Donald Trump and his cronies must have wondered why Pakistan’s tribesmen in Khyber Pakhtunkhwa (K-P) and Balochistan staged an anti-US rally. The reason behind this rally taking place was to protest Trump’s remarks about Pakistan not “doing enough” in the war in Afghanistan. Our people (particularly the tribesmen) have suffered immensely due to Trump’s policies, particularly the drone attacks which killed thousands of innocent people. Furthermore, they have suffered due to his failure to stop terrorists in Afghanistan from killing civilians. And to rub salt in our wounds, Trump asked India to help crush the Afghans! In Pakistan, we know that Trump is not reasonable, but surely he can’t be ignorant enough to not know about India’s involvement in the war and its efforts to destabilise Pakistan. Hence, it is only in Trump’s own interest to withdraw from Afghanistan. It seems that Trump is a victim of anti-Pakistan propaganda launched by Indians. Anti-Muslim Indians have always been convinced that Pakistan is on the brink of collapse, and would have disappeared from the map long ago if the US hadn’t provided it with aid. Nowadays, in addition to the Americans, the Chinese are also being blamed for helping us survive. In numerous videos on the internet, Indians can be seen telling people not to buy Chinese toys for their children “because China is helping Pakistan and Pakistan is India’s enemy”. In fact, at the time of the Partition, Jawaharlal Nehru predicted that the new country (Pakistan) would not be able to last more than six months. He fully expected that Muhammad Ali Jinnah would beg him to take Pakistan back into India. 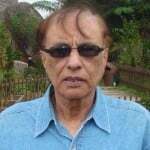 Moreover, after the breakup of Pakistan in 1971, Indian analysts were confident that in a matter of a year or so, what remained of Pakistan would disintegrate and four new countries would emerge. But despite the loss of East Pakistan, we remained united and the Indians were disillusioned. In his book ‘The Contractor’, Raymond Davis also says that “without America’s financial support, Pakistan’s economy would go into freefall”. Apparently, he too has been brainwashed to believe that Pakistan is too fragile to exist without American help. Perhaps that is one reason why Trump and his cronies blame Pakistan for his country’s failure to win the Afghan war. After enduring much humiliation for many years now, with the Americans constantly asking us to “do more”, it is time to ask ourselves whether we really need US aid. First of all, it should be understood that the aid given to poor countries by the US is not out of its love for them. Let’s say that a dam has to be built, and the US agrees to provide funds for it. The full amount of aid never reaches the country it is meant to help. A good chunk of it goes to American nationals for preparing feasibility reports, and engineering designs. American consultants and contractors have to be appointed for the project. So, the aid gets reduced to less than a quarter of the original sum. A small amount of the received figure is then paid to local sub-contractors who provide labour, while the major beneficiaries are the corrupt bureaucrats and others through whom the funds are channelled. The same is true for the so-called “assistance” provided by the Americans. Under this assistance, scholarships are given to the children of our elite to study in American universities, while government officers are sent to the US for training. So far, such training has not yielded any results, as even a layman knows that conditions in the country have not improved. In the past, the US has not only stopped giving us aid but has actually imposed sanctions intended to cripple us. In 1963, when Pakistan announced that its airlines would commence commercial flights to China, President Lyndon B Johnson withheld a $4.30 million loan which was to be spent for upgrading our airports. In 1990, under the Pakistan-specific Pressler Amendment, President George Bush halted a $570 million fund because of suspicions that Pakistan was developing a nuclear weapon. Again, we managed to survive. In 1998, after Pakistan’s nuclear tests, the US imposed sanctions on Pakistan. Indian analysts were jubilant, thinking that this was a death blow for Pakistan. They fully expected mass hunger and deaths due to the shortage of food. That did not happen, and we managed to survive. So it is evident that the common Pakistani has not benefited from US aid, it is only the elite and the corrupt that get the fruit of this so-called “aid”. Pakistan has not been able to make any progress due to the fallout of the war in its neighbourhood. This should be made clear to the Americans. And now to analyse how much US aid (about a billion dollars a year) “helps” our economy. Our budget is $45 billion, and what we get from the US is only about 2% of what we require. If the US decides to stop sending aid to Pakistan, it will have a very negligible effect on us, and this has been proved in the past. We shall have to tighten our belts, sure, but the government can take effective measures to bridge the gap. The feudal lords and the rich people who sit in our assemblies, who pay only nominal taxes, will have to agree to pay increased taxes on the goods they purchase (such as luxury cars and frequent trips around the world). We have made mistakes in the past, like agreeing to help the US with its war in Afghanistan. In fact, when George Bush wanted to use our airspace and roads for the invasion of Afghanistan, our leaders agreed unconditionally. We could have asked for our external debt to be written off (considering that the Americans had earlier offered Turkey $26 billion to help them invade Iraq, an offer which the self-respecting Turks had refused). But now, our government can ask for compensation for those Pakistanis who have been killed in this war. The US pays $100,000 to the family of every American killed while fighting to defend his or her country. We have lost about 80,000 people in a war which we never even wanted, a war that was never ours to begin with. So why can’t we ask the Americans to pay that amount ($8 billion) to the families of the people killed in this conflict? And if they don’t agree, we can ask them to pack up and leave, goodbye to their “aid”!